Thanks to Smitten Kitchen, I’m having a love affair with baked goods today. 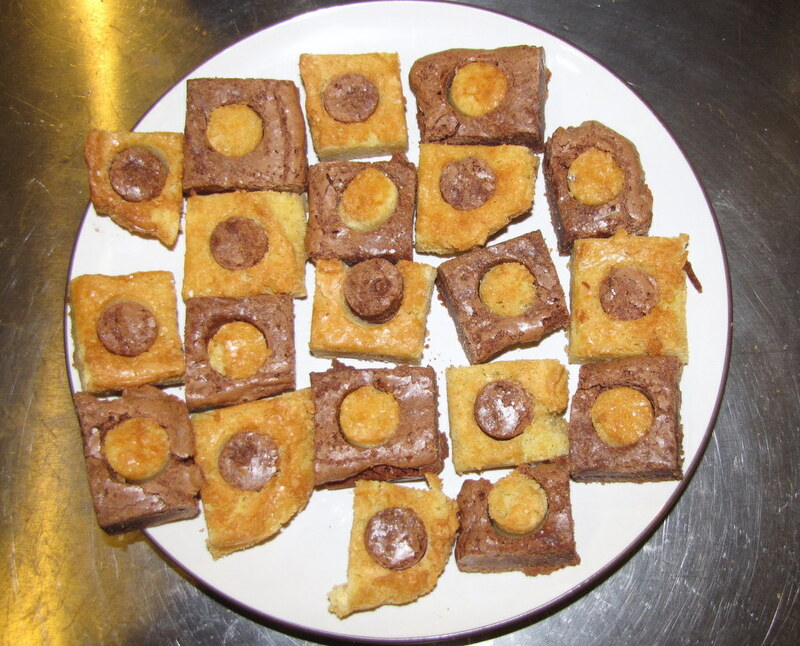 I made these brownies and blondies (white chocolate brownies) last night for a teacher at school who won a library contest I held last week. When I send out a library newsletter, I also run a contest to see who can email me the highlights first. For my fall newsletter I made Grant’s Brownies for the winning teacher, but when I saw the heart shaped confections on Smitten Kitchen I knew that’s what I wanted to make. But then I was out sick for 3 days, and then my brilliant idea of using Lincoln and Washington shaped cookie cutters was thwarted by the shear size of them (3.5″, yielding a total of 3 brownies per pan). So I decided to just cut out circles. They’re not as pretty as the originals, but man oh man are they delicious. I have been a loyal, steadfast user of Grant’s brownie recipe for 5 years now…and I think there’s a new sheriff in town. Not least because of the ease and quickness of these suckers. One bowl couldn’t be easier, or faster. And the recipe is identical, just swap white chocolate for semi-sweet to get blondies. I made and baked both pans side by side, the prep took 15 minutes tops. I’m not going to bother blogging this recipe, since Deb’s already done it so beautifully. But go get you some of these…NOW.